We’ve been planning this trip since December. The three of us, plus J and DvA, one night on the Superior Hiking Trail during a week in a Superior beach cottage. We packed, arrived, plotted… and Lee was sick. Spent a day in bed sick. So… we decided to do it anyway. DvA took his stove, as planned, and also the dinner food, which Lee had been going to carry. I took the entire tent, all of the non-dinner food for the two of us, and Boo’s clothes. Boo took her animal ID pamphlet, binoculars, Z-bars, hiking hankie, and warm hat. We decided to take the loop from Penn Blvd. to Bear Lake campsite, then loop back on the Twin Lakes Spur. Just over 3 miles each way. Topo looked hilly, but not something beyond the kids if we fed and rested them sufficiently. And just for fun, we’d all 7 of us start the hike, and the non-overnighters would turn back at some point. We started at the parking lot and found the main trail easily with the signs. Blue blazes were abundant on trees and across the bare rock. Boo and R lead the way, with sticks taller than they were. I took tail and had a good hike with J while he took pictures. The trail was rocky and rolling. 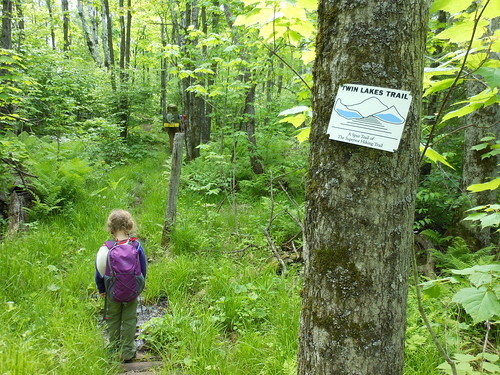 It was easy for me, as a navigating novice, to keep track of where we were along the trail from the pocket map we got from the Superior Hiking Trail Store in Two Harbors. J also practiced navigating. There were a few rocky upwards bits, and some of our day hikers were pondering turning back. And we came upon a rocky knob. So we ate lunch overlooking Superior and Silver Bay? Smashed Sammiches, grapes, and ginger cookies. Yummy. Then Lee, G, and R turned back to retrace our steps to the parking lot. Boo and I got a little sniffly about Lee turning back. G volunteered to carry all the lunch garbage back! After lunch, the trail got rockier and steeper. Boo and J trooped up and down together. The trail started peeking out over the ridge cliff. Eventually we were walking along the exposed ridge, and I was chanting “Keep right, keep right” as the kids wanted to look over the edge and I wanted them to stay the heck away from the edge. The kids were very excited. Boo fell several times and collected a couple bandaids, but just kept going. Boo had an empty water bladder at lunch. I guess it’s time for a larger bladder. I let her drink out of my tube until we found somewhere to refill. We crossed a tiny stream and I tried my luck. I had practiced using the Steripen when we got it, because a piece of equipment you can’t use is useless. So I knew it worked. I filled up the water bottle. Inserted the pen. Pushed the button. Sad face. Sad face? Repeat several times. Grow increasingly frustrated. Pack it all up. Just as a whim, push the button with the pen out of the water. Hey, now it’s ready to go! Well, that’s embarrassing. But I got my kiddo some nice cold water. Went up rock steps to Bean Lake. Wow. It’s up very high. The weather was beautiful. Sunny, a little breeze. The high was supposed to be 62, but I was in short sleeves all day. The trail to the lakeside campsites was actually the hardest part of the trail for short legs. It was a fairly steep downhill with big rocks. I held her hand and caught her stumbles the whole way down. 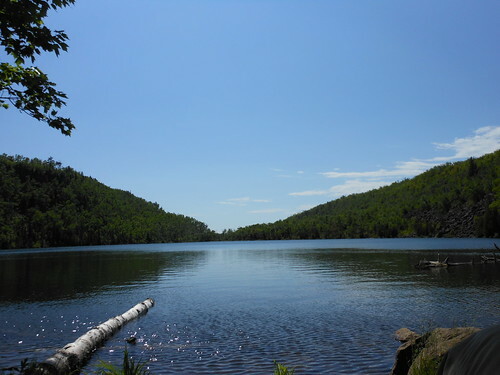 Once we reached the lake, the trail continued along the shore before reaching the campsites. More uneven rocks. More holding Boo’s hands as she struggled with the uneven ground. We dropped our bags at the first tent pad. J and DvA hadn’t come back down the hill. We later learned that they were looking for J’s hat. We explored the second tent pad, and Boo found it far superior. I told her we couldn’t set up without discussing with J and DvA. When they arrived (no hat, it vanished sometime between the ridge and the campsite), J and Boo both liked the second site better. We decided by me picking a number between one and ten, and Boo was closer. Before setting up, the kids had to take pictures of all the bags. Boo had wanted a pic of all the bags since we started, and we hadn’t gotten them neatly lined up until then. J not only took a pic of all the bags in a line, but he also got each bag individually. 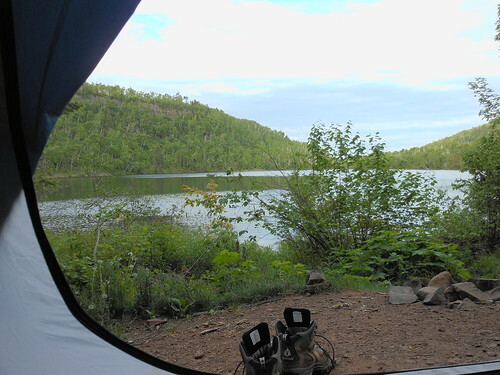 The first tent pad is almost level with the lake and has easy water access. The second site is up and back a few feet, and it’s slightly more difficult to just walk into the lake. The tent pad is just slightly larger. It was a very tight fit for a generously-sized 3-man tent. In fact, our back door was up against a rock, and the opposite corner was pretty steep. There was just enough room to squeeze into the firepit area, and no room to stake out the back vestibule of the rainfly. Luckily, it was dry. Boo helped me unroll the tent, put together the poles, clip the corners of the rainfly, and set up the sleeping pads and bags. She’s gotten tall enough that she could hook up the gear loft! Boo went down to the water’s edge and came screaming back up. “Baba, Baba, I saw a frog! I saw a frog!” Are you scared? Yes. Ah. I explained that frogs only eat bugs, and are very shy, much more scared of her. Then I walked her back down to the water. It was a big leopard frog. We talked about it. I was amazed it didn’t jump away from us. But when J came over after setting up their camp, Boo told him all about the frog and they went looking for more. The kids loved it. At either site, there was a good rock to sit on and play in the lake. There were at least a dozen strings or ropes hanging in the trees, carefully coiled and then kicked under something, or just lying forgotten and abandoned. The kids salvaged them for fishing line, tug-o-war, clotheslines, and the string to a bow and arrow. There were minnows and tadpoles in the water. The only bad part about the site is that it’s very rocky. So instead of running around barefoot, the kids had to stay in their hiking shoes or step very carefully. They still managed to get filthy. The view is one I could watch for days. I had been expecting to refill our water by myself. But Boo really wanted to help. So I let her hold the Steripen in the bottle until it had a smiley face. Then J wanted to help. Boo was not willing to share, but let him count down the numbers. DvA cooked dinner. Which is good, since I’m not a great cook at the best of times. Chicken, stuffing, and dried cranberries. With dairy-free sage stuffing, it was Lee safe even though she wasn’t there. I believe it’s the same dinner she made when we went to Backbone State Park in Iowa when I had such a bad migraine. Boo didn’t take a lot, ate even less, then spilled all over herself. I was pondering a good scrub with a wet hankie versus a swim in a cold, rocky lake when DvA suggested an immersion. Always willing to be lead with a good idea, I had her strip right there in the sun while I found her PJs and the towel. I waded in with her and washed her face with the hankie. She complained that it was cold. I said she could either have a hankie scrub or a quick dunk. She picked a dunking. I waded out a little deeper so I didn’t get lake sediment all over when I dunked her, and put her in quick. She levitated back out squealing from the cold. I dried her off with the camp towel. “I like it! It makes me feel all warm!” Put her in PJs. She and J ran around while DvA and I hung the food and put away the dishes. (He’d washed the dishes while I washed and dried my girl.) I washed the towel, my Smartwool shirt, and Boo’s hankie and hung them to dry. I got out my notebook and Boo commandeered it. She tried to write “walked” but couldn’t get it on one line, so she gave up and drew a picture instead. I was tired, so I declared bedtime probably horribly early. Sure the campsite was in shadow, but it was still plenty light out. Boo wiggled around, and from the evidence on my camera, got up without me noticing to take pictures through the tent windows. She wanted to snuggle with her legs across me in my bag. Once I got her into her own bag and mostly still, I completed passing out. Next morning I awoke in the gray dawn. Boo was still cocooned in her bag. The world was just starting to wake up. And I heard the loon. Now, I’d always heard loon calls described as eerie or lonely, but I had never heard them that way. Until that morning. The sound was bouncing off the surrounding cliffs… and it was a lonely, eerie sound. I fell back asleep. I was woken up by a bright, cheerful grin. “Baba, I need to go potty!” So we put our shoes on and trekked up to the latrine (I have never had such a view for doing business). DvA and J were dressed and eating their oatmeal. We dressed and joined them. Boo had one packet of oatmeal and some cocoa and proclaimed herself done. I should have realized she usually eats twice that much on a normal, non-backpacking morning. As we were finishing up breakfast, a couple birds flew past. “Hey, those are those loons!” They circled the lake and flew past again. And again. “Man, if I’d known I’d have had time to grab my camera- “ and they landed in the middle of the lake. They reared up, flapping a few times. Amazing. Boo and I went back to our site to get ready to go. As I was puttering around organizing things how I wanted them, I saw the loons silently glide past, maybe 5 feet from shore. “Boo! Boo, go look at the lake!” “No, I’m tying knots.” “Boo, stop and go look at the lake now.” “Oh, those are the loons?” I lived in MN for 18 years. I had never seen loons as more than distant dots in the water. She sees new critters so often she didn’t understand how rare this is. I packed up. Boo ferried things around, got in the way trying to help, actually did help with the tent dropping and folding. I tasked her with making sure all the ropes she and J had tied around the camp were untied. And we were off. 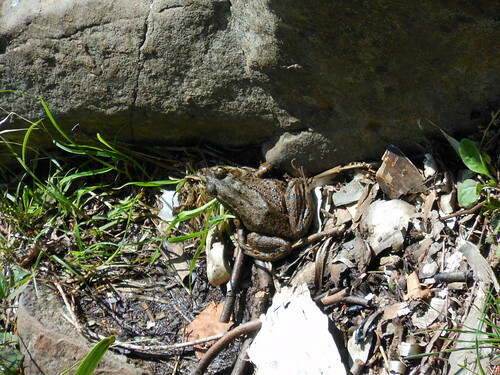 Even before starting up the hill, we saw another big leopard frog. Not as big as the one the night before, but still a sizeable critter. Boo still needed her hand held all the way from the campsite to the main path. That made it significantly harder to get myself up. At the main trail, we had to first hop across a trickle of water. But after that it was clear sailing. It was a rude awakening of our muscles to go from bopping around camp to climbing from lake level straight to the top of the ridge. Boo only made it with some well-placed bribes of granola bar. There were more beautiful views. 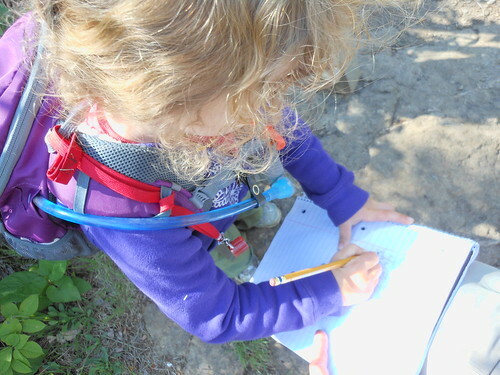 At the junction of the SHT and the Twin Lakes Trail, we signed the register. 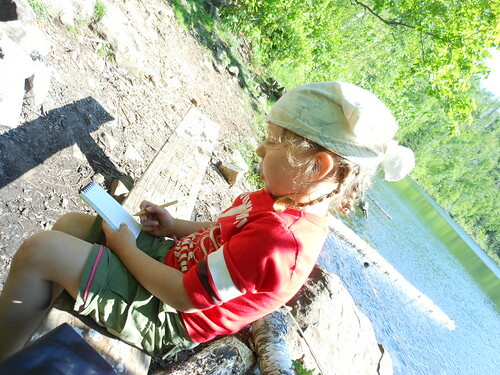 DvA wrote a note for all of us (“Birch, how old are you?” “Ummm…..”), then Boo wrote her name too. J and I discussed which way we were going at the intersection. He guessed all over the place. Once he took his compass out and oriented the map, he got it. Boo was whiney, even after I fed her an entire granola bar. She didn’t perk up until we took a rest (where the Twin Lakes trail splits to head to town or to meet up with the SHT) and she inhaled another granola bar. Then I realized I had not given her a sufficient breakfast. Oops. The Twin Lakes spur is a different beast than the section of SHT we’d done. It was wooded, more rolling than rocky cliffs. The trail broke out to overlook the lakes a couple times, once where we could see the ridge we’d walked along the day before. Boo liked to hike fast with DvA. I took my time and stayed tail. 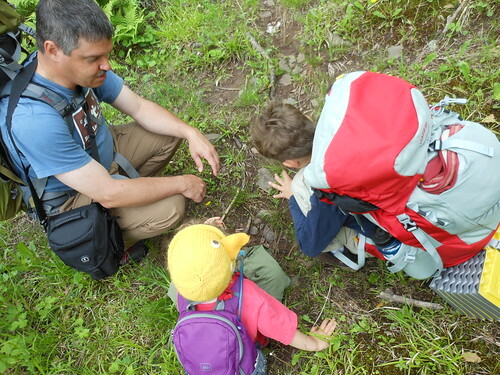 As I caught up from a pit stop, I found them all crouched down eating dandelion greens. There are logs across the wet sections of trail. Which is fine for adult or 8-year-old feet. But Boo’s shoes fit between the logs too easily, and she walked out of her shoe into ankle-deep mud early in the day. I had packed an extra set of socks, because I know my girl is not at all concerned about stepping in water. There were lots of flowers on the wild strawberries. Somebody is going to have a nice snack. We reached a spur trail to a knob, and DvA went up. Oddly, both kids declined. Until he came back down and we were 10 feet down the trail, when Boo started sobbing broken-heartedly that she wanted to see the knob, too! I am a softie for a girl crying for more hiking (I can’t deny her when she asks for a treat of fruits or veggies, either), so up we went while DvA and J hiked on ahead. So we arrived at the intersection back to the SHT to find their bags neatly abandoned against the sign. Boo was concerned they’d left us. 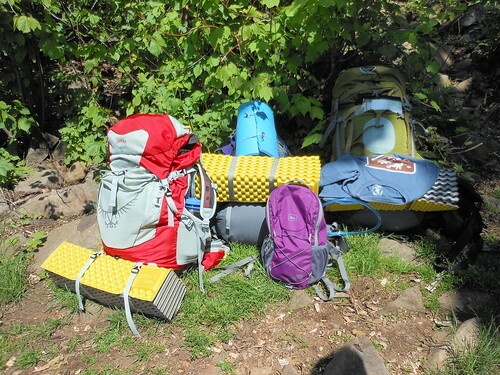 I was about to drop out bags and wait, when I spied them hiding in the bushes up the trail. So I suggested we start hiking and they’d catch up. “Rawr!” Boo screamed happily as they jumped out at us. We took a short break. Boo had already emptied her water bladder, but I had brought a full bottle and refilled it. We had lunch on the same knob as the day before. Boo picked up the stick that she’d abandoned the day before. I told her if it hit one person one time it was going back in the woods. She chanted on her way down the trail. We took a lot more breaks on the way back. The kids were tired. The adults may have been tired. We got back to the trailhead around 1:30. 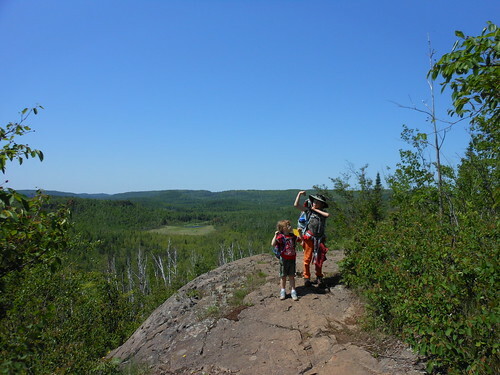 Have you been on the Superior Hiking Trail? What did you think? Haven't done any of the SHT yet, but we'll get there before too long. It's one of the trails the dog is learning to carry a pack for. Love to hear from you guys if you end up that way again, or anywhere else up here in northern MN. We will be up that way again, I'm sure. I'm still sad that I didn't get to go with on the overnight. We will be in the Perham area in August. That might be a bit far, but it may work out. More camping? Or something else? Maybe not even all that far now that I've looked @ a map.